Chances are walking is something you take for granted. After all, you've most likely been doing it almost every single day for your whole life. By now, it's on autopilot. You don't give it a second thought, you just walk. And, when it comes to exercise, walking can be a great whole body activity with little risk of injury. If you're lucky, going for a walk can be as simple as throwing on your shoes and stepping out your front door. But even when you make the choice to intentionally "go for a walk", you probably aren't paying much attention to how your body is going through the motions of walking, you're just walking. Maybe you're rehashing an argument with your significant other, trying to problem solve a work issue, herding littles or (hopefully) taking in the scenery around you. You may be thinking that walking isn't rocket science, and since you've already mastered walking, what's the big deal? You already know how to walk. If you’ve been around this blog for any length of time, you know we talk a lot about how you do what you do. If you're new to this blog, welcome! I'm glad you're here. How you do what you do can make the difference between moving in ways that reinforce the current state of your body or moving in ways that support improvements in strength, mobility and function. Or, how you walk can provide you with some great benefits. Walking can help maintain and improve bone density, after all, it's a weight-bearing activity, but you'll miss out if you're taking poor movement habits into your walk. Walking can help keep your pelvic floor and glutes strong, but not if you're taking some common movement habits into your walk. Walking can tone your triceps and support mobility through your shoulder girdle but...... you guessed it, only if you're using your arms well, and no, I'm not talking about carrying hand weights. Keep in mind, there are a lot of variables when it comes to walking. Not only is your walking influenced by your movement habits, it's also influenced by where you're walking. Terrain variables like whether or not the surface you're traveling over is smooth, rocky, slippery, uneven, uphill, downhill or flat will all change how you walk. There is no one way to walk that is appropriate for all of those variables. That said, there are some general principles you can practice to improve the quality of your walking and reap benefits from your time spent walking. If you're going to put the time and energy into walking, you might as well learn to walk well, right? Chances are you walk with your feet turned out to some extent. Chances are you turn out one of your feet more than the other. Walking with turned out feet has an impact on your toes, especially your big toe joint, as well as your ankles, knees and hips. One of many cool things about bones is that they're constantly remodeling and reshaping in response to the forces being applied to them. Believe it or not, walking with turned out feet may contribute to bunion formation. When your feet are turned out, your big toe is pushed towards your little toe with every step you take. Combine this effect with shoes that are tapered at the toe (which is the shape of almost all shoes) and over time, the big toe joint becomes displaced. In response to these forces from walking and shoes, the body lays down a protective bone callous of sorts at the big toe joint, also known as a bunion. Turning out also changes the plane of motion that your ankle moves in. Instead of a front to back plane of motion, it tends to roll in and out causing increased wear and tear on your ankles and further up the line to your knees and hips. Last but not least, turning out changes how the muscles in your lower leg and hips are being used. When your feet face forward, your calf muscles and hip flexors (those muscles that cross the front of your hip joint) have the opportunity to lengthen more with each step than when your feet are turned out. Does this mean you should never walk with your feet turned out? No. Turning your feet out can come in handy for better balance on slippery surfaces or the next time you're crossing a log. In general though, keeping your feet forward as your default position when walking will be better for your ankles, knees and hips over the long run. NOTE: If you've spent a lifetime walking with turned out feet, don't immediately correct your feet to straight. Make a more gradual change over time (days and weeks). 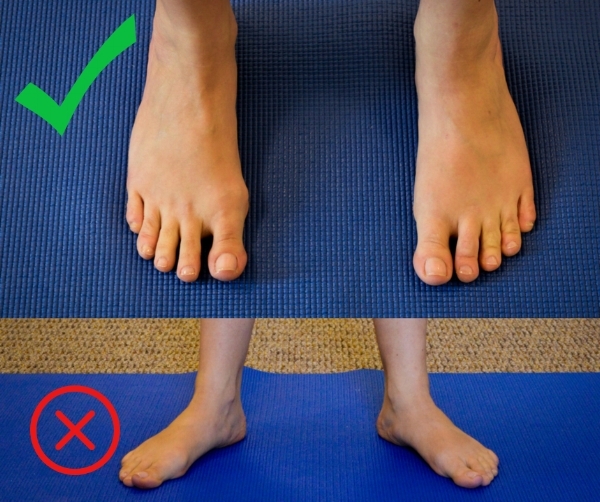 Every little incremental shift towards straight feet is progress and by making this change more slowly, you'll give your body a chance to adjust and integrate the change with more ease. Pause for a moment here and step away from your screen to take a few steps with your hands on the sides of your pelvis. As you walk, pay attention to whether or not each side of your pelvis travels forward along with the leg on that side as you step. In other words, does the right side of your pelvis twist forward as you step onto your right leg? There will be some movement of your pelvis when you walk, but ideally not much. Ideally, when you walk your glutes are engaging and the muscles that travel down the front of your hip joint, your hip flexors, are lengthening with every step you take. Most people have tight hip flexors from lack of movement and lots of sitting. Twisting the pelvis with each step is one way to bypass that hip flexor tension. When you're walking over flat and level ground, your standing leg moves behind your pelvis as your body and opposite leg travel forward. Imagine your standing leg is a paddle. Remember how a paddle moves back to propel the boat forward? You're going to do the same thing with your standing leg. 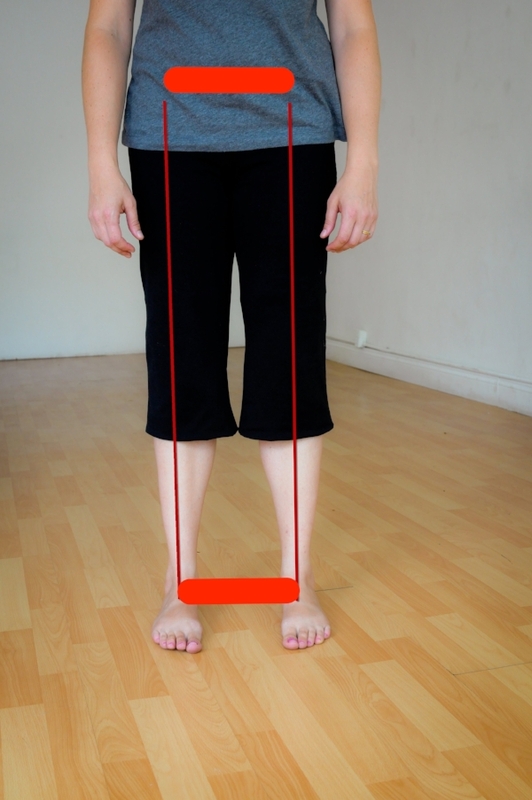 Your standing leg will move back and your body and opposite leg travel forward as a result. As you "paddle" your standing leg back, your glute muscles activate and your hip flexor muscles, those muscles that travel down the front of your hip joint, lengthen. When you walk in this way, your time spent walking helps develop and maintain glute strength and stretch your hip flexors with every step that you take. That means you just turned your 30-minute walk into 30 minutes of hip flexor stretches and glute strengthening exercise. Plus you got to enjoy some time outdoors. Yay! 1. It supports stable sacroiliac joints. Your sacrum sits in the back between the left and right sides of your pelvis. Where the pelvis and the sacrum meet are known as the sacroiliac joints. While those joints are surrounded by ligaments and muscles to help stabilize them, the joint itself is still capable of a little bit of movement. Too much movement and the joint loses some of its stability which may contribute to sacroiliac joint problems. Keep your glutes strong and you'll support the stability of your SI joints. 2. It supports the function of your pelvic floor muscles. Some of the ligaments that support your pelvic organs attach to your sacrum along with some of the muscles of your pelvic floor. A stable attachment point for those ligaments and muscles helps your pelvic organs stay up where they belong and helps your pelvic floor stay strong and do its job well. Have you ever paid attention to foot prints in the snow or sand? If you have, you may have noticed how close together people's foot prints are. It's as if they're walking a tightrope, one foot in front of the other. Notice in the photo on the right how the heel of this person's left foot crosses to the right of the heel of their right foot. When you walk with a narrow stance like that you miss out on the opportunity to strengthen the muscles on the sides of your pelvis - your lateral hip muscles. Those muscles help to stabilize your pelvis and play an important supporting role in pelvic floor function. Next time you go for a walk, imagine that each one of your feet has its own railroad track to travel along. The distance between your railroad tracks is the same as the width of the front of your pelvis. As you walk, make sure that each foot stays on its track and doesn't drift towards the center. This will feel strange! I call it the full diaper walk :-). Over time, you will feel less awkward and your muscles lateral hip muscles will be stronger. You've probably been taught that shoulders back and chest up is "good" posture. That last one probably has you scratching your head. How can standing up "straight" weaken your abs? After all, in the "No!" image on the left I clearly looks like I have stronger abs than in the "Yes!" image on the right where my belly is sticking out a bit. Looks can be deceiving though. Yes, I have flatter abs in the photo on the left but here's the thing flat abs do not equal strong abs. When I have my rib cage stacked over my pelvis, my abs are able to engage much better when I move than when I have my rib cage lifted up. The amount of force a muscle is able to generate depends upon the orientation of its attachment points. Your abdominal muscles attach to your rib cage and your pelvis. Stack your rib cage over your pelvis and your abdominal muscle attachment points are in a position to generate more force. Lift your rib cage up and out and you compromise the amount of force your abdominal muscles can generate. Check out the experiment I demo in this video and you'll experience what I'm talking about. When you walk you can let your arms swing (see video below for some tips) or you can carry something. Each choice has its benefits and, as usual, I recommend mixing it up. Bonus points for carrying something in one arm while letting the other arm swing. Your core will have to work extra hard to stabilize your trunk because of the uneven load. Make sure to watch your rib cage alignment (see Tip #4) so you can reap those core benefits. You can also spend a little time on your walks stretching your arms. Find a tree trunk, branch, pole, monkey bars or door frame and do a little hanging or leaning. It's great for opening up the chest and shoulder girdle, areas that are often in dire need. Take a tip from the musical Hamilton, and look around! Chances are you don't look much further than your computer screen or the walls of your office or house most of your day. Your eyes have muscles, too! They need to move in a variety of ways and stretch and contract to stay healthy, just like any other muscle of your body. Taking a walk outside is a great opportunity to move your eye muscles. As you walk, notice what's far off in the distance. Distance vision is vastly underused for most people thanks to modern, indoor living. Notice what's above, below and on either side as well. Sky, trees, buildings, little creatures, interesting plants, etc. There's so much there when you take the time to look and notice. Experiment with letting your eyes do the looking rather than your head. Most people move their head to look up, down or to the side. They forget their eyes are capable of moving in their sockets and instead their head and neck do all the work. Ask your eyes to participate in looking up, down and side to side and you'll be giving your eye muscles a valuable workout. Go gently with these. 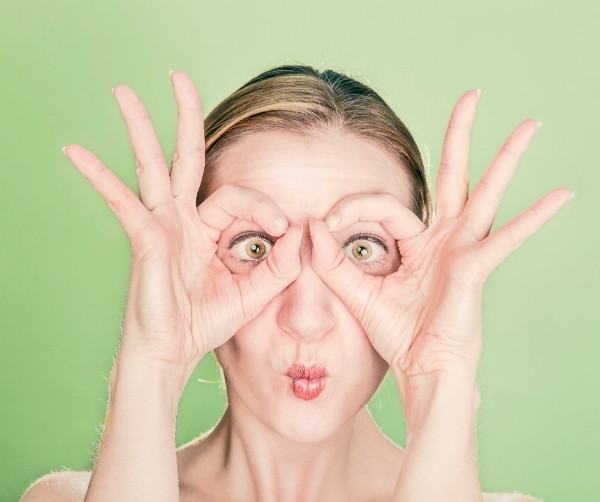 A little goes a long way when it comes to underused eye muscles. Do you find yourself always walking the same speed? 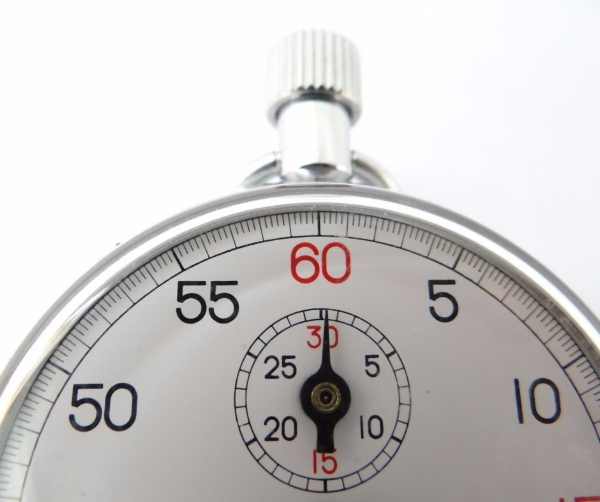 It's pretty common to have a default speed, whether that's faster pace or a slower, more laid back pace. Interestingly, where you live has an impact on how fast you walk. If you tend to be a speedy walker, spend a few minutes on your next walk consciously sloooowing down. Slowing down will help you notice some of your default walking habits. Slowing down will also help you implement some of these tips. It takes time to change a habit and do something as radical and strange as walking with straight feet after a lifetime spent walking turned out. If you're more like me, someone who walks with at a more moderate tempo, add some speed into your walks. You don't need to turn into a speed walker but try moving just a little more quickly on some of your walks or for a part of your walk. You'll notice when you speed up your pace, your arms naturally swing more (see Tip #5) if you're not carrying anything or anyone. Whether you're speeding up or slowing down your default, you're asking your body and brain to work differently. Variety is a good thing. 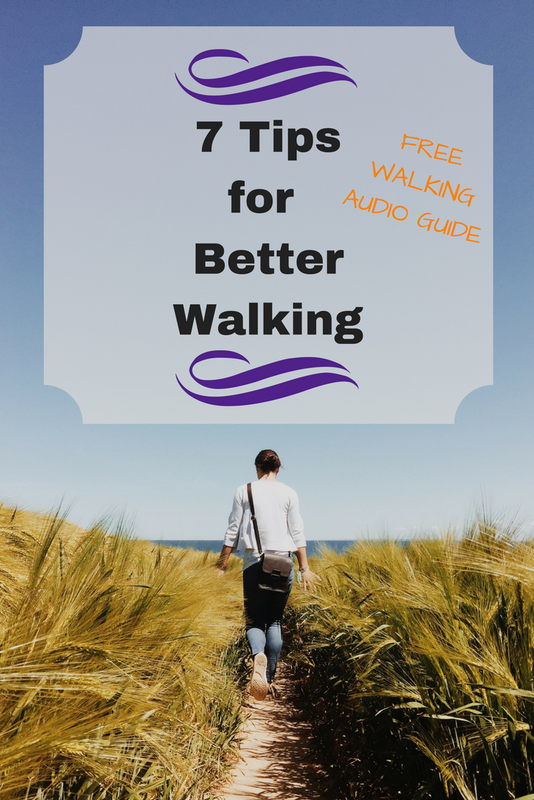 Chances are you're an overachiever like most of my lovely readers and want to incorporate all seven of these tips into your next walk. As a recovering overachiever, I say this with love, please don't. Pick one thing to try out on your next walk. Just one! Play with it. Think of it as an experiment. Notice what it's like to try something different as you walk. Notice how easy it is to get distracted and slip back into old habits. That's ok. Try again when you realize you got distracted. The next time you go for a walk, try something else. Remember to be patient with yourself. Remember to sometimes forget all of these things and just walk for the sheer joy of moving and being alive.